With the latest Chrome update, you need to click on the "click here" link in the Flash warning banner to allow Flash to run. It will continue to work until you close the browser. Yes, but that's the problem- Each time I close the browser and later log into Arlo, Chrome gives me a warning banner and requires me to authorize Flash to run again. There's no one-time fix for the problem. Honetly, there shouldn't be a situation where users should get a warning banner in the first place. Is Arlo/Netgear planning to upgrade its video delivery to be compatible with Chrome? Hard ot believe they aren't working on it already. Worse: It does _always_ start with a faux "A newer version of Adobe Flash Player is required. Please install the latest version from here." - it's just B.S. - not only on Chrome, but also on Edge. Agree: While there is no way around the Flash permission request on more nand more browsers, issuing a _false_ information ref. an update required (what is simply not possible, users can't update neither the Chrome nor the Edge built-in Flash run-time using the standard Flash updater/installer. As of writing, we have to click on an update link wich doesn't do an update, much more it seems to trigger the built-in Flash (and the browser Flash permission request mechanisms). This has not much to do with serious programming or user guidance. Convinced they play on a coming-up HTML5 implementation - however it's much to late. The browser makers were clear about the phase-out plans and information. Not quite a work around, but there is no reason to click allow flash. Showing under the click here banner, I am able to view two of the four box icons showing under the library and click there, then view the saved footage. The only reason to allow flash is if you need to view live cam. the bigger issue is netgear/arlo pushing us to use their (less functional) mobile app over a web app that only supports Adobe Flash. Why netgear/arlo are using a notoriously insecure API (Adobe Flash) to access a security system is beyond me. This design flaw / limitation shows a considerable lack of understanding on the part of netgear/arlo. I get they want us all to use only our mobile devices to access Arlo but the fact is, the web interface is the least confusing of the options available to Arlo users. The hardware is pretty good, if very expensive compared to other solutions, but the software's user interface is clunky, buggy and inconsistent across all platforms: mobile and web. (I design UI for a living so I know of what I speak. Poor UI is a common problem in the home security space, but IMHO netgear/arlo's UI is abysmal). Forcing non-technical users to jump through additional hoops to enable insecure flash on our desktop / laptop browsers just adds insult to injury. I paid a LOT of money for these cameras and continue to pay a LOT of money for the subscription, but when the yearly subscription is up in mid-january, I am selling my cameras and base stations and terminating my subscription. i'm cutting my losses. if there's HTML5 browser support by january 15th (when my current subscription runs out) I will renew but if netgear/arlo continues to force me over to platform specific apps I am bailing. No, nothing works with Flash.I've tried 50 times. Any Internet Security garbage installed on your computer? Several 2029 "versions" are known for having whatever random security "policies" in place breaking Arlo snd other legal Adobe Flash usage. Bitdefender 2019 is one of these. Complete garbage: One does not block things without notifying the user. You may have to add exceptions for my.arlo.com resp the older arlo.netgear.com sites. No need to update Flash-unless viewing live cam. When I first Login, I am brought to the main devices page where I see my two cams. The top is mostly covered with the Flash banner to click. Instead of clicking the banner, I can view two of the four box icons showing Library and click those. That brings me to where I want to be anyway-the library without having to allow latest Flash. No need to click allow Flash at all! Unless you want to view Live Cam, which I rarely ever do. I generally always want to view Library anyway. No need to update Flash-unless viewing live cam. ... No need to click allow Flash at all! ... I generally always want to view Library anyway. No rocket science: The Library clip player was migrated to HTML5 some releases ago, so no more Flash involved for Library clip playback. I don’t care if playback is HTML5, I need live playback without flash. The clock is ticking.... if anyone wants to buy some cheap HD Arlo cameras, contact me off list. I’m bailing on this sad excuse for home security. Two or three additional clicks are required when open get Arlo Web Client for the moment - and things continue to work. A little to much to claim that Chrome (and other browser makers btw.) broke it. Not a secret: The intended changes were documented in time, Chrome Beta and daily builds clearly showed the way to the situation we have today. If the Flash based live view does not longer work at all, some other *** Internet Security layers are - without any obvious indications - prohibiting Flash execution. That's neither an Arlo nor a browser maker thing. Of course, a plain HTML5 implementation would be preferred. However it's not absolutely mandatory for the next few months at least. So - bottom line - If everyone knows exactly what the fix is, why would Arlo/Netgear not output the live camera view in HTML5? As they can see from this discussion, users who spent a ton of money on the Arlo system are now leaving this platform. The Arlo brand is being hurt and customers lost because a simple fix is not being offered. SMH. Running stock browser in stock environment. The latest change rendered the Arlo flash based live view inoperable. HTML 5 has been around for years. Replaying video has been working with HTML5 and Arlo. The deficiency is with Arlo. Doesn’t matter to me. I’m tired of waiting for them to fix it, dumping Arlo for the competition.. I design software for a living. Requiring an insecure API to access a security function, and then blaming device security for the malfunction- it’s just beyond. We can argue about Flash needing to be removed as a requirement (it does) but in the meantime, it is what it is and it isn't going to change until it does. Right now, with the latest Chrome, all you need to o is click on the "click here" link in the Flash warning banner and then allow Flash to run. If you don't need live view, just click anyplace else and the banner will disappear until you go back to the Devices tab. So why isn't the text adopted accordingly in the "warning" banner? Instead it does continue to say ... well, you know. Can't be difficult to detect at least the browser and version, and adopt. Requiring an insecure API to access a security function, and then blaming device security for the malfunction- it’s just beyond. Refering the "insecure API" to the need of running Flash, which remains required for a while? If this is the only shortcoming of the Arlo system (and many other so called home security devices) you should be lucky. I'm not going to list them all. Wireless and security? Lol #1. Devices without tampering protection, no security erase, plain text config accessible via physical serial console? Lol #2. A system not alerting if a device is ripped off the wall? Lol#3. A system not alerting when a device does disappear? Lol #4. And you complain about the Flash requirement? Mery Christmas, and Happy New Year! Ok, I didn't know it wasn't available in chrome 71. I don't use chrome as my main browser, but have it installed. Was on version 70, so updated to latest version 71. 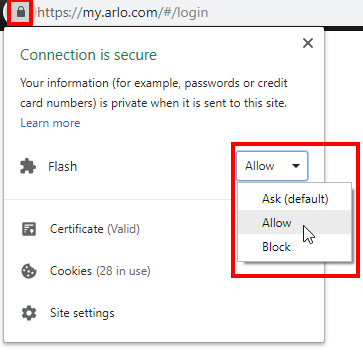 Go to the Arlo website, log in, chrome tells me there is a newer version of flash available click here, I click, chrome asks me to allow or block flash, I choose allow, chrome now refreshes the web page since flash settings were changed, which logs you out of the Arlo site, which it should, normal behaivor. I log back in and everything is working fine in chrome. Win7 and Win10. Also Edge works fine on the Arlo website as well, maybe anyone having issues with chrome should try Edge in the mean time. Not sure what the issue is but its all working for me. Me too! - Just installed the Arlo Wireless VMS3330 system and like everyone else apparently, there is an issue with Flash and any Windows web browser like Chrome. Flash is integrated into Chrome and you dont update Flash manually as it is suggested when logged into the Arlo website. After responding to the Arlo msg to update Flash it brings up the popup to ALLOW/BLOCK Flash and after selecting ALLOW, you get the Plugin blocked error and are logged off and the login screen is reloaded. If you login again after this the cameras work OK. If you are running Version 71.0.3578.98, try to click on the "lock" icon on the URL address bar. Then click on the down button next to Flash and click on Allow. I just reinstalled Chrome due to the issue and the latest/current level is Version 71.0.3578.98. Flash was already set to ALLOW on the pulldown for the LOCK icon. I also updated Flash under Site settings to ALLOW. Still get initial plugin blocked for Flash, perhaps due to the #/login added to the website url. But now I can login and watch camera videos w/o getting thrown off and having to login again. As simple as 1-2-3-4-5 on opening a new browser session to the cloud before the live view can be used. Sigh, nothing we can change. One day I hope Arlo Web Client will be fully HTML5 and Flash can be flushed. Tried everything I read here and still can't login. Then found this - https://www.theverge.com/2016/5/15/11679394/chrome-to-block-flash-later-2016. Google is now blocking Flash in Chrome. Arlo-Netgear is way behind the times and needs to change. Now I have to use my iphone Arlo app to look at videos on a small screen. Shame on you Arlo!! Cheers and I'm impatiently waiting. Tried everything I read here and still can't login. ... Google is now blocking Flash in Chrome. No, at least not yet, or not yet fully. I've tried to post some 1-2-3-4-5 images above, unfortunately these are still not moderated. How unprofessional Arlo moderators!!! There are few clicks required every time on opening a new browser session to the Arlo cloud. Then the Flash based live view does continue to work, and will continue to work certainly up to Chrome 73 (currently in Canary resp. daily build state). If it's still not working, review some potentially in place Internet Security "garbage" introducing and enforcing policies you have not asked for, including blocking any Flash applets - without getting a warning.